I'm not much of a baker. Sweet stuff is better left to my better half, mostly because its way more science than cooking and I'm a little too free-form to be constrained by measurements and rules (also, I tend to over-indulge in the licking-the-cake-spoon department). But occasionally I'll pull out the flour and sugar and do the damn thing. Once upon a time, a little while ago, my amazing Godmother made amazing lavender cookies. I don't know if there was a specific occasion to go along with them, but they were there and I ate them and they were so.good. I've thought about them on occasion since that day. And since I now live in one of the only neighborhoods where you can buy lavender without too much struggle (oh, Middle Eastern Bakery, you are The. Best.) I knew it was only a matter of time before I was having enough of a bad day to know I needed to make some soothing, smellgood cookies. Recipe courtesy George Duran (by way of AEM). Preheat the oven to 350 degrees F. Line 2 baking sheets with parchment paper or use silicone baking sheets. Put the flour, sugar, baking soda, ginger, lavender, and salt into a bowl and whisk together to combine. In a small bowl, whisk together the olive oil, milk, vanilla. Add the liquid ingredients to the dry ingredients, stirring with a wooden spoon until you form a nice smooth dough (my dough was super crumbly, so I kept adding additional tablespoons of milk, and ended up using about 3 additional table spoons before I got a consistency I was okay with; even after the additional milk they still required a little bit of TLC to be made into ball-shapes, but once cooked, they tasted perfect). They were just as awesome as I remembered them. After taking an informal poll of all the people who got to have a few, the boys all said they tasted like soap. The girls, however, said they tasted like a delightful secret garden experience in yo' mouth. I am inclined to agree with the girls. 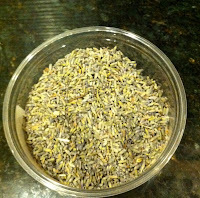 Lavender is such a strong scent, that it can be over- powering, but the olive-oil seemed to neutralize it. Make them, and let me know what you think. 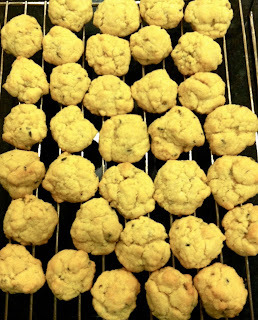 After I shared my batch, someone told me that apparently Princess Kate over there in jolly ole England is apparently big into lavender biscuits (which is what they call cookies over there, I guess. Probably because Pillsbury hasn't really gotten into the UK market). They were instrumental in helping to sooth her yucky preggo tummy in the first trimester. While my friend was not preggo, she was having some of the bubble guts and apparently these made her feel surprisingly better. So not only are they crazydelicious, they're medicinal too! Also, in other news, I've decided I hate the lighting in my kitchen. Everything looks so harsh and unappetizing. As I continue to spend more time than expected barefoot and in the kitchen, I'm also working on how to make the pictures of food I take look not gross. Any insight into how I can do this (without becoming a photoshop whiz) would be greatly appreciated.